I've been laying low this summer, and with the exception of Figure Inspiration Group, I've not been drawing or painting. Instead, I'm taking a hiatus for just a little while. There were several interactions that happened with a particular individual in a drawing group that I enjoyed going to, especially since it was nearby. It felt like an ambush and was meant to humiliate me in front of the other members of this group. Even when I was alone, this person cornered me and was either scolding me because of what I brought as my contribution for the potluck or saying something so offensive that it could very well be construed as racist (you should take the Sumei e because that's my thing she curtly said) . After this happened, I decided to skip the next week trying to let things cool off, but when I returned the next week, this person would not let it go and, again, in front of everyone, began to speak about this show I was not accepted in, but she was. Honestly, I was disappointed about not being accepted, but it definitely was not the end of the world for me - you win some, you lose some and sometimes it rains. However, I was not the one who brought it up, this person went out of her way to try to make me look bad and put herself up there. This whole interaction totally knocked me down because I thought we were friends. I don't know how the other members of this drawing group felt about it, but I can only imagine it was awkward for them. For me, life is too short to feel bad and I don't go to drawing groups to be chastised and made to feel like a loser by some bully. These kind of things really set me back for awhile, but I always get back on my feet and go on. Although I love being a part of art groups for the support and camaraderie, but I can't waste my time continuing to be unhappy with something I love. This drawing is among other incredible drawings by super stellar artists. You can check it out here: CPSA Silent Auction . Our days at Figure Inspiration Group are numbered. The landlords are kicking Bravo School of Arts out and because we sublease on Tuesday mornings, that means us as well. There are other issues going on, but suffice to say we will no longer be meeting after the end of August. The San Diego Watercolor Society, however, has a figure life drawing group that meets on Thursdays, so once my trip to Chicago is over and FIG is over, I'll be joining that group. 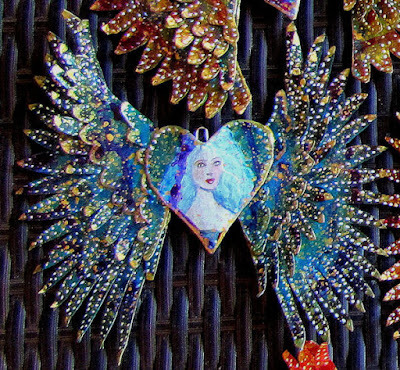 They were fun to make, but I should know better than to join two swaps! 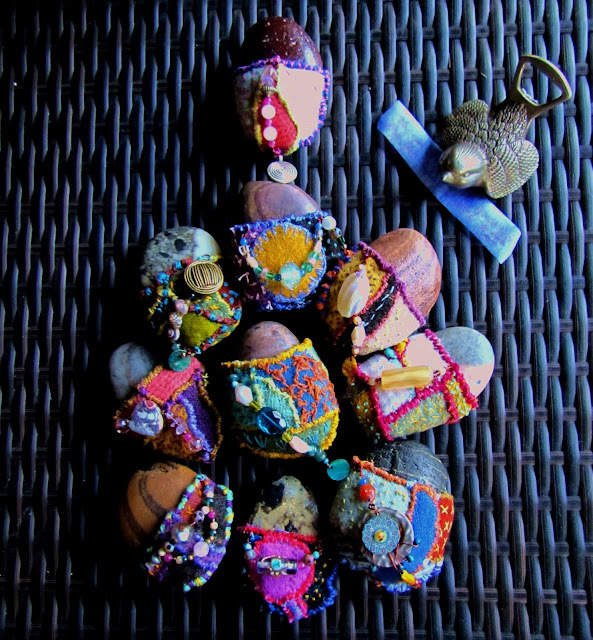 My next venture was to sew Talisman rocks with charms that I saw in an article "Objects of Comfort" from the artist Virginia Gertenbach in the February/March 2018 issue. I fell in love with them on sight and had to make my own. They will be my gifts to a particular group of artists I'll be seeing later in the year. Mine are probably a little more colorful and incorporate beads and bits of old jewelry donated by another friend. Each rock has a message tucked inside that I got from one of my meditation apps and it says, "May you be happy, may you be safe, may your heart be at peace". And with that, I wish you the same and to have a lovely summer!